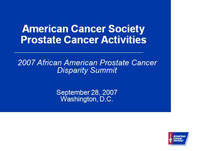 The "3rd Annual African American Prostate Cancer Disparity Summit" was a very successful event that rose on the solid foundation established by the first two summits. 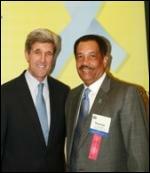 Senator JOHN KERRY and Congressman GREGORY MEEKS (both pictured above), with their staffs, joined with PHEN for the third consecutive year in hosting this annual event. Please click on the summit logo above for information on the summit program and participants. 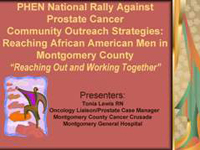 With the framework for action established during the 2006 summit, PHEN launched the national "PHEN Rally Against Prostate Cancer" in September preceeding this summit. A major focus of the summit was on this national initiative with a session on the subject during the first day. Click on the rally logo and subject presentations for more information. 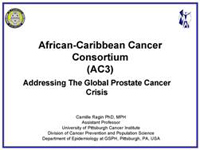 The "Global Black Prostate Cancer Crisis" was afforded a session based on the initial look at this subject during the 2006 summit. 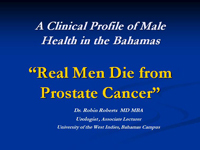 A better understanding and comparison of the prostate health of black men in the United States with other men around the world of African descent is felt to hold important keys to addressing this crisis and the overall war on prostate cancer. This session was clearly one of the summit's highlights. 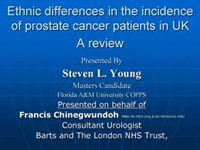 Presentations on this subject and others are available on the right side of this page for review - click on any presentation to view it. Dr. LOUIS SULLIVAN, former U. S. Health and Human Services Secretary (pictured above), was the luncheon speaker on the subject of health "Cost-vs-Care" and its impact on minority populations. 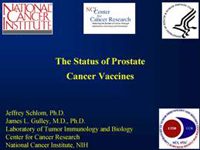 2007 witnessed the FDA controversial non-approval of the first immunotherapy vaccine for prostate cancer to come before it for approval. This potential new treatment had been on the agendas of both the 2005 and 2006 summits. 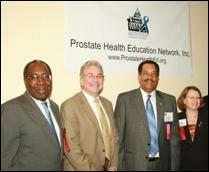 This summit included a presentation on the "Status of prostate cancer vaccines." 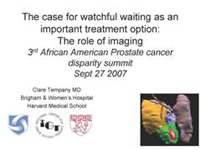 Watchful waiting through "active surveillance", the use of imaging technologies for early detection and active surveillance, access to expensive new treatments, and community research approaches were all important presentations and discussions at this summit. Staff members of congressional leaders participated in a session on "effective advocacy strategies" and summarized new and important prostate cancer legislative initiatives. 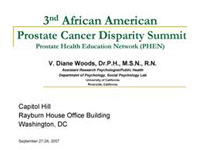 The "3rd Annual African American Prostate Cancer Disparity Summit" was energized through compelling presentations and audience participation. There was a great sense of accomplishment that the framework for effectively addressing the disparity was continuing to evolve. This framework includes a committed group of medical and research specialists, survivors, congressional leaders, government officials, and advocates working together as a team growing and expanding in reach and influence. While this team is beginning to impact on legislative initiatives, research agenda's, policies, and education and awareness outreach on the ground, there remains tremendous challenges within each of these areas and others. There is an acute understanding that to significantly reduce the suffering and deaths caused by the largest racial disparity for any type of major cancer, there needs to be a greater urgency of action at all levels, and more resources.